Don’t miss this opportunity to be a part of a Live (and we mean Live!) 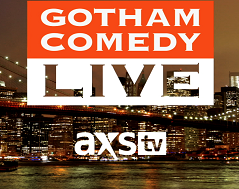 Comedy TV Shoot that will be airing on AXS TV on Thursday's at 10PM (did we mention it will be Live!). ***THIS IS A LIVE TV SHOOT. YOU MUST ARRIVE NO LATER THAN 9:15PM IN ORDER TO BE SEATED. With Forrest Shaw, Shuli, Jeff Young, Shuli & Jessica Kirson!